My Little Review of Once Jilted by Ciara Gold. 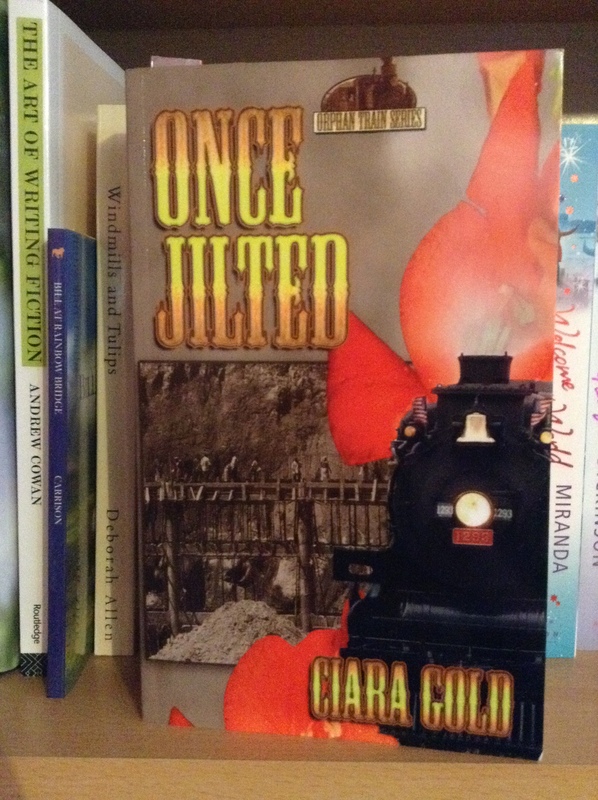 Once Jilted by Ciara Gold is a really special and heart-warming read. I first got this book on my kindle after reading a few of Ciara Gold’s other books, and a few years later I got it in paperback because it became one of my favourite books to read. The book itself is about Shauna Joyce who was once an orphan herself, she had been through the gut-wrenching heartache of never being loved and treated with real kindness. When the orphan train brings along more orphans, the family Shauna Joyce lives with goes to the auction. She meets a young orphan with a limp named Sarabeth. Shauna Joyce wants to adopt her, however being without a husband and a home she is turned down. Sarabeth ends up in the hands of a family that will never love her or see her as anything more than help around the house. Now Shauna Joyce has weeks to find a husband, so she can take this amazing little girl home with her and save her from a loveless life. Kane McKenna is some way through building a bridge and finishing the bridge is the only thing he wants to do. When Shauna Joyce’s life collides with his own. Will he be the answer to her prayers? And help her bring joy to Sarabeth life. A must read to find out. I found this novel emotional and inspiring, the way Shauna Joyce would do anything to give Sarabeth a life full of love and happiness. I would highly recommend this novel, it truly touched my heart with every page. I wasn’t able to put it down for long. ← The Musings Of Smokey. It sounds like a very special book. Thanks Hun, it was a great touching read. This sounds like a very special book. Thanks for a great review! Thanks, It’s a great read, one of my favourites.